The Lockgate Refleks diesel heater has now been used for three years and whilst I have cleaned it a number of times I decided that today it was getting a more thorough clean. The diesel passes through an external valve and then a filter in the base of the regulator. From there it enters the burning chamber via a small hole in the side wall at the base. When the heater is working correctly the diesel is vapourised by the heat and burns. It’s hard to see how the stove actually works as there is a cylindrical wire cage in the middle of the burning chamber to assist with the combustion. There are also two thin stainless steel donought shaped baffle plates fitted horizontally in the top of the burning chamber. These have a 5” diameter hole in the middle. Fortunately I have small hands and can managed to reach past the baffles into the base of the chamber. Today I decided to clean the chamber with two wire brushes. But first I had to remove the cage and baffles. The cage just lifts out but each baffle is held in place by three small horizontal stainless steel tags. I managed to get a thumbnail under the end of each tag and pry it vertical. The diameter of the top baffle is greater than the opening in the top of the stove and I had to bow it slightly to remove it through the top. After attempting to use the large wire brush I found the smaller brush more effective. It was one of a pack of three purchased at the 99p Shop. 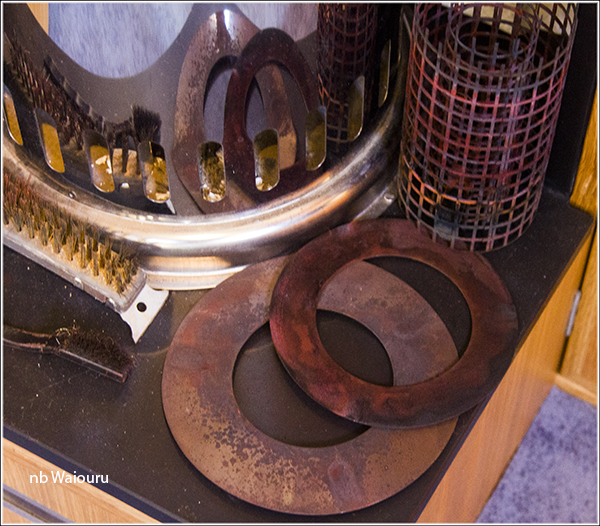 The next photo shows the chamber after I had cleaned it. A and B point to the three small stainless steel tags which press down horizontally over the baffles. I wouldn’t want to do this too frequently as metal fatigue might occur. At the top of the burning chamber immediately underneath the top baffle is a circle of large holes. 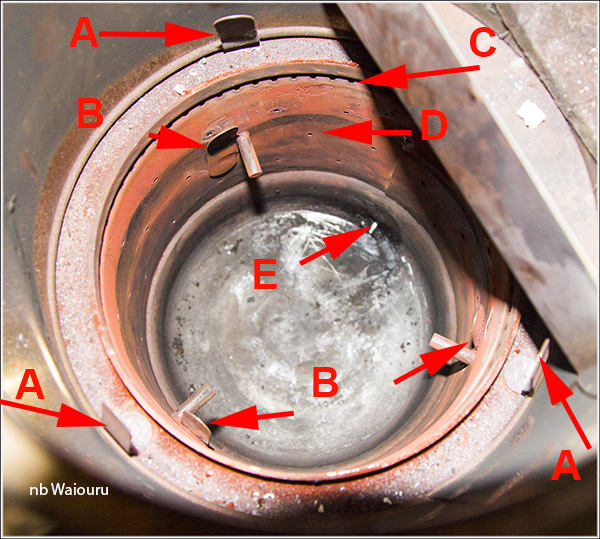 When the stove is burning on a high setting blue flames are supposed to come out of these holes [arrow C]. I made sure they were all free of carbon build-up. Around the vertical wall of the camber below the second baffle are rows of smaller holes [arrow D]. These allow air to enter the chamber to assist with combustion. After wire brushing the wall I used the end of a 2mm HSS bit to poke through each hole to ensure it was clean. In the base [arrow E] is a hole for the diesel to enter the chamber [arrow E]. I our case I have only ever noticed the tip of the cleaning pin appear in this hole (as shown in the photo). After I had done a final clean of the stove the pin was able to protrude a good 2” into the chamber. This leads me to believe there had been a build-up of carbon around the point where the diesel entered the chamber. The combustion chamber was then reassembled and I turned my attention to the regulator. I haven’t worked out how to get the plastic nob off the top of the regulator (no screw… it must clip on somehow). Not wanting to break it, I decided to check the fuel filter in the base of the regulator. This is accessed by removing two machine screws and metal cover plate. The rubber seal can then be removed. I used paper towels to capture the diesel that leaked out. Of course I had already turned of the fuel valve to the stove. The filter looked fine and the diesel was clear so I reassembled everything and lit the stove. It’s now working much better.